It was the year 1898. William McKinley, a Republican from Ohio, was President, his assassination at the hands of an anarchist still three years away. The Spanish-American War was in full swing. Hawaii was annexed as a US territory. The Wright Brothers had yet to fly, and the initial laying of the RMS Titanic‘s hull was eleven years in the future. And, of course, from the last post, we know that men’s suits were selling for $12 and a glass of soda cost a nickel. By no means the largest maritime disaster to have taken place prior to 14 October 1898, nonetheless the tragic downing that day of the SS Mohegan off Cornwall’s Lizard Peninsula near the village of Porthoustock, was a major event that found its way onto the headlines of the world’s newspapers, large and small. The loss was inarguably a huge blow to all the families on both sides of the Atlantic who so abruptly and unexpectedly lost their precious loved ones. Of the Mohegan’s 146 passengers (roughly two-thirds were crew), 106 souls were lost including Robert Packer Brodhead‘s sister-in-law Emilie Loveland Luke (age 32) and her husband Loren M. Luke (age 28) of Kingston, Luzerne Co., Pennsylvania. The ship had gone off course on the evening of 14 October—just a day after departing London. The night was clear but the the currents and winds were strong. 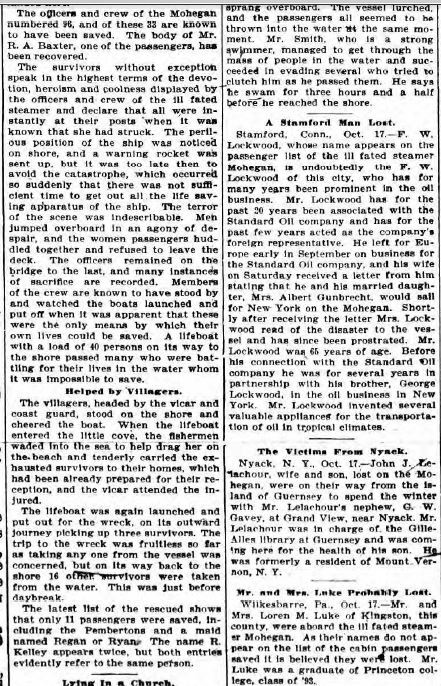 Just as the passengers were sitting down for their evening meal, the Mohegan smashed into a submerged reef called the Manacles (about a mile from shore), and sank so quickly that only 40 passengers—those who made it into the first lifeboats (mostly women) and those who survived the plunge into the rugged seas and the jagged rocks below—managed to escape. All the officers, including Captain Griffith, whose skills had always been highly regarded, drowned. Many people were severely injured on the rocks—some to the point that they succumbed from their injuries even after being rescued from the water. Villagers on land had witnessed the Mohegan too close to shore before the accident and knew the vessel was in trouble. Some set off immediately in boats hoping to get there in time to assist with an evacuation, but the ship sank too quickly. Rescuers in a lifeboat found 14 exhausted and near-drowned crew members on the rocks. A tugboat picked up one survivor who’d been in the water over seven hours and was able to give an initial account of the accident. Most of the dead passengers were affluent Americans who were returning home from time spent in Europe on business or pleasure. The Mohegan, owned by the Atlantic Transport Line, was part passenger liner and part animal carrier (it had 700 stalls for cattle); the accommodations on board for the human travelers were very opulent and comfortable. The vessel, originally named the Cleopatra, was built for a leisurely Atlantic crossing not for speed. She was purchased by the Atlantic Transport Line to replace ships that had been commandeered by the US government for duty in the Spanish-American War. It had only undertaken one previous voyage (in July 1898), which was fraught with mechanical problems that grounded the vessel until she was felt to be sea worthy again—in time for the October 13th sailing. By then, she had been renamed the Mohegan and was manned by a crew who thought her bad luck. Robert P. Brodhead, husband of Fanny V. Loveland; son of Andrew Jackson Brodhead & Ophelia Easton. Initially the Luke, Loveland, and Brodhead families of Kingston had severe doubts as to whether the couple had actually been on board. 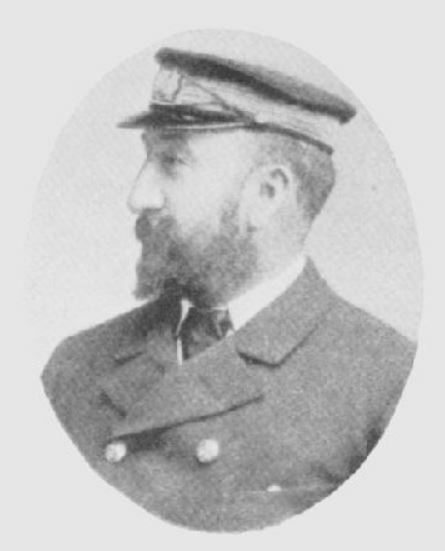 Robert Brodhead had received a letter from the couple several days before the accident saying they would be departing on October 13 on the steamer Victoria; but Robert then learned that for some reason the Victoria sailed early—on October 9—and that her sister ship, the Mohegan, sailed on the 13th. (The switch it seems may well have had to do with some of the Mohegan’s mechanical problems taking longer to solve than expected). The family in Kingston initially did not want to fear the worst and questioned the initial passenger list that showed the Lukes as having been on board the downed vessel. Sadly, within days, the families’ fears were realized when Loren Luke’s uncle received a telegram from Vicar Diggins of the St. Keverne church (St. Keverne is a village near Porthoustock) to which bodies had been taken for identification and, in some cases, burial. The telegram stated that Loren’s body had been identified and that there were still four women yet to be identified. It was presumed that one of them was Emilie, and eventually that identification was made. 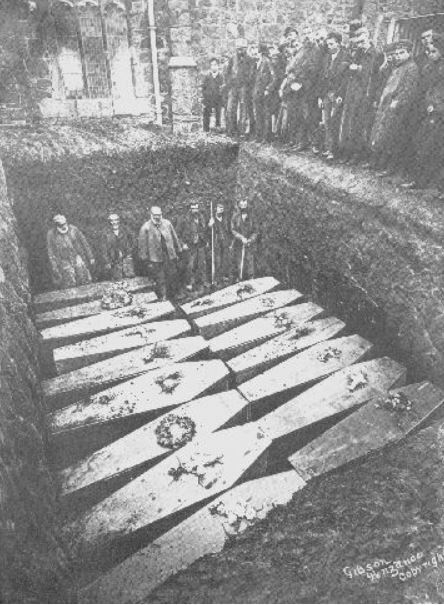 Most, if not all, of the deceased Americans on board were embalmed by morticians sent down to Cornwall from London (the local area had not yet made it a practice to embalm the dead). Once embalmed, the bodies made the long journey back to the US on the SS Menonimee, a sister ship of the ill-fated Mohegan. Many of the others who were lost were laid to rest in a common grave in St. Keverne churchyard, where a memorial and stained glass window honor their memory. For the Lovelands in particular this was yet another cruel twist of fate. Emilie Loveland Luke’s parents, William and Linda Loveland, had seven children in all; three had died as infants: firstborn Ellen Tiffany and the last two children (both boys)—William and John Walter. Another daughter, Mary Buckingham Loveland (wife of Rev. George N. Makely), died in June 1895, leaving just three children among the living: Fanny Vaughn Loveland Brodhead, Elizabeth Shepherd Brodhead, and Emilie. Earlier in 1898, in the month of March, Mr. Loveland (William) passed away. So with Emilie swept away by the Mohegan disaster, Mrs. Loveland was left with just two of her seven children. Compounding all the grief felt by the family was surely an additional factor—and that is the reason Emilie and Luke had gone abroad that August in the first place. On July 31, they lost their first child, an infant son named simply ‘Loveland Luke,’ who was born on October 21, 1897. Emilie had taken the loss exceptionally hard, and sensing that a change of scenery may do her some good, Loren organized the trip abroad. They departed on the SS Victoria in mid-August for a two-month stay in Europe. 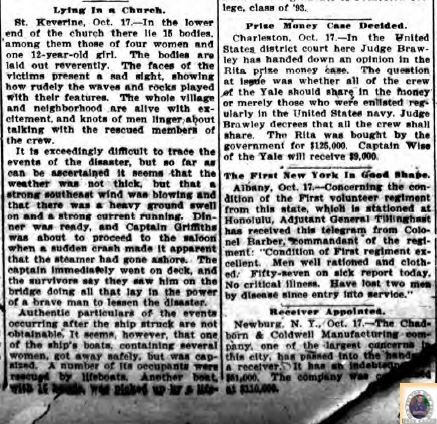 The Wilkes-Barre Times of November 7, 1898, mentioned that Robert P. Brodhead was in New York City making arrangements to bring the bodies of Loren and Emilie home to Kingston. Robert P. Brodhead, the eighth child of Andrew Jackson Brodhead and Ophelia Easton Brodhead, was one of my great grandfather Andrew Douglas Brodhead’s younger brothers. Robert married Kingston native Fanny Vaughn Loveland in 1889; the couple lived in Kingston where Robert developed a successful career as a contractor, eventually heading Brodhead Contracting Company. He’s the one who purchased Wheat Plains, the old family farm south of Milford that had temporarily gone out of the family’s possession. In November 1896, Fanny’s younger sister Emilie married Loren M. Luke, an 1893 Princeton graduate, Kingston attorney, and highly regarded member of the Luzerne County bar association. In his spare time, he taught classes in English grammar at the YMCA, was secretary of the Princeton Alumni Association, and was involved with Sunday School. Loren had a home built on Wyoming Avenue for Emilie in advance of their November 1896 nuptials. 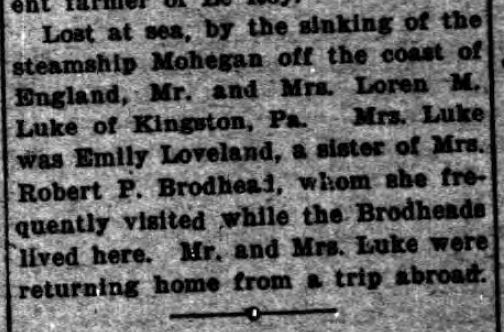 The Brodheads and Lukes both lived in Kingston and the Loveland sisters remained very close, visiting each other frequently. Such devastating losses must have been impossible to bear at times. And the following spring of 1899, Robert and Fanny Brodhead endured another tragic loss—their first-born child, a son named Robert aged 10, died of diphtheria. Perhaps all that was more than Mrs. William Loveland could bear, as she died a year later in June of 1900. Rumors abounded as to what caused the Mohegan to go off course. The official verdict was human error, but some thought the weather that day had somehow affected the ship’s instrumentation. And, some villagers claimed to have seen Captain Griffith rescued by a lifeboat and then disappearing into the hills, causing some to rumor that he purposely wrecked the ship due to financial woes (he was an American Transport Lines shareholder and could thus collect insurance monies). As it turned out, the ship was grossly underinsured. Even a quarter of a century later, the event was mentioned in a “25 Years Ago” column in the Caledonia New York Advertiser (see clipping). Today, the SS Mohegan is one of the UK’s most famous wrecks for scuba diving. That beams from Edith’s eyes on me. “Postscript. Four O’Clock. Mr. Luke’s Body Identified. 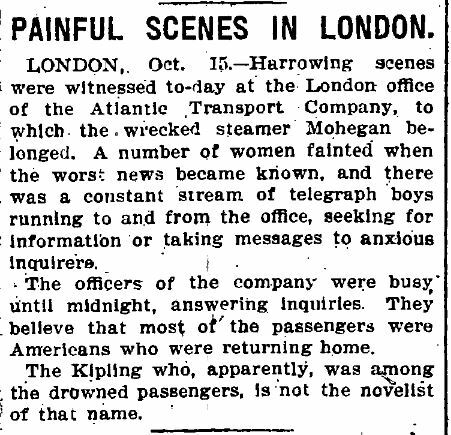 Telegram Received This Morning – No Women Yet Identified,” Monday, October 17, 1898, Wilkes-Barre Times (Wilkes-Barre, PA), p. 6. “Beautiful Tributes. To the Late Loren M. Luke from Members of the Bar, Saturday,” October 22, 1898, Wilkes-Barre Times (Wilkes-Barre, PA), p. 5. “The Mohegan Disaster. Interesting Illustrations Reprinted from the London Illustrated News,” Monday, November 7, 1898, Wilkes-Barre Times (Wilkes-Barre, PA), p. 7. “Kingston,” November 7, 1898, Wilkes-Barre Times (Wilkes-Barre, PA), p. 7. “A Double Funeral. 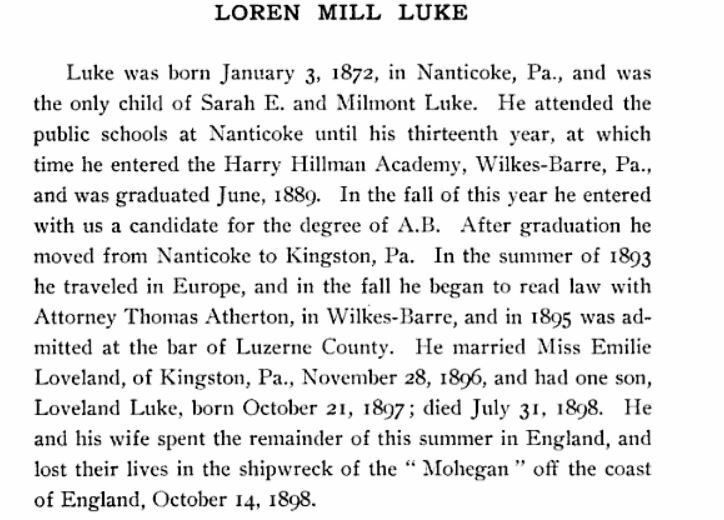 The Remains of Mr. and Mrs. Loren M. Luke Interred in Forty Fort Cemetery,” Wednesday, November 9, 1898, Wilkes-Barre Times (Wilkes-Barre, PA), p. 6.